Let’s continue in the “Best of 2013” spirit and take a look back and see what art pieces I painted last year. My commission schedule was packed last year and I had the honor of painting 23 custom orders last year, and did a total of 33 paintings. 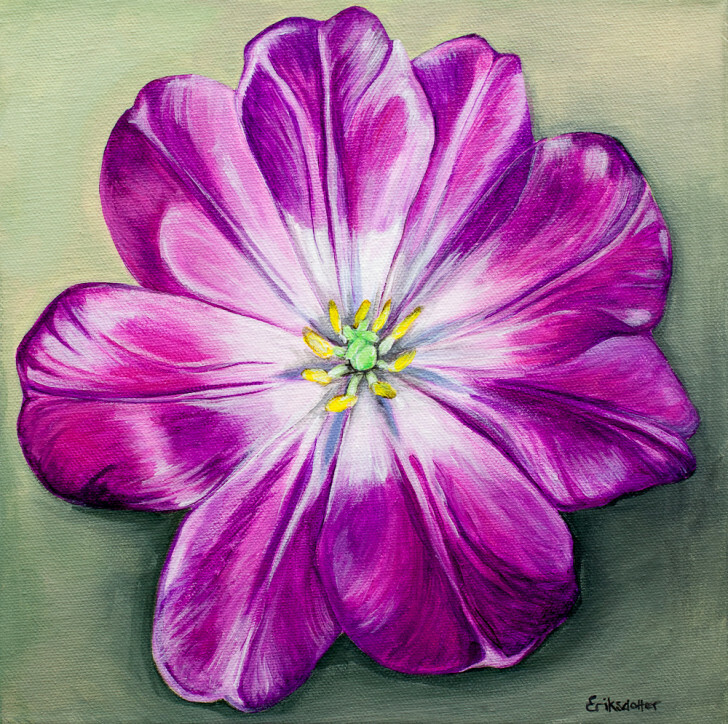 Unwavering Tulips were commissioned by a client who had seen my work at a gallery in New Jersey who represents my work. 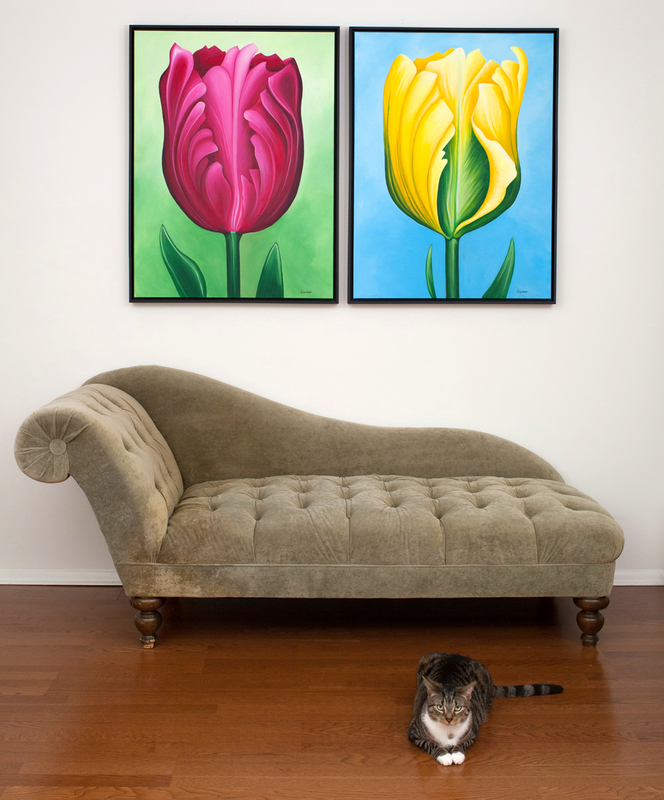 He loved “Single Tulip” and wanted two similar pieces in bolder colors for the living room of his 14-bedroom beach house. Read more about this painting or view more photos in the modern gallery. Let’s continue with flowers and “Tara’s Bridal Bouquet.” This painting was commissioned by a client who wanted to give something very special to her future daughter-in-law. Since the wedding to her son was several months off, she gave a gift certificate to her future daughter-in-law to open during her bridal shower. How sweet! Once the wedding photos came in, I started working on this piece. The painting is AMAZING! I can’t thank you enough! I know how much love and talent went into this project and I am so excited to have such a special gift for my daughter-in-law! She is going to cherish this, I know! Read more about this painting or view more photos in the bridal gallery. “Melanie’s Bridal Bouquet” was another “Bridal Shower” gift – my clients are so thoughtful and smart! This painting was commissioned by a client who already had her very own bridal bouquet painting and loved it so much she wanted to give away one as a wedding gift to her friend. Melanie received a gift certificate for her bridal bouquet painting, and while she loved my art, she wasn’t sure she wanted to capture her whole bouquet on canvas and found herself more drawn to my up-close flower paintings and the “charcoal” style, like Spots of Color. I suggested an off centered close-up view of one of her lovely peonies, in the style of a pencil drawing with a blush pink center to give it a little bit of life. Here’s a really lovely photo of the painting hanging on the wall that Melanie sent me (permission to use). Read more about this painting and view more photos in the bridal gallery. 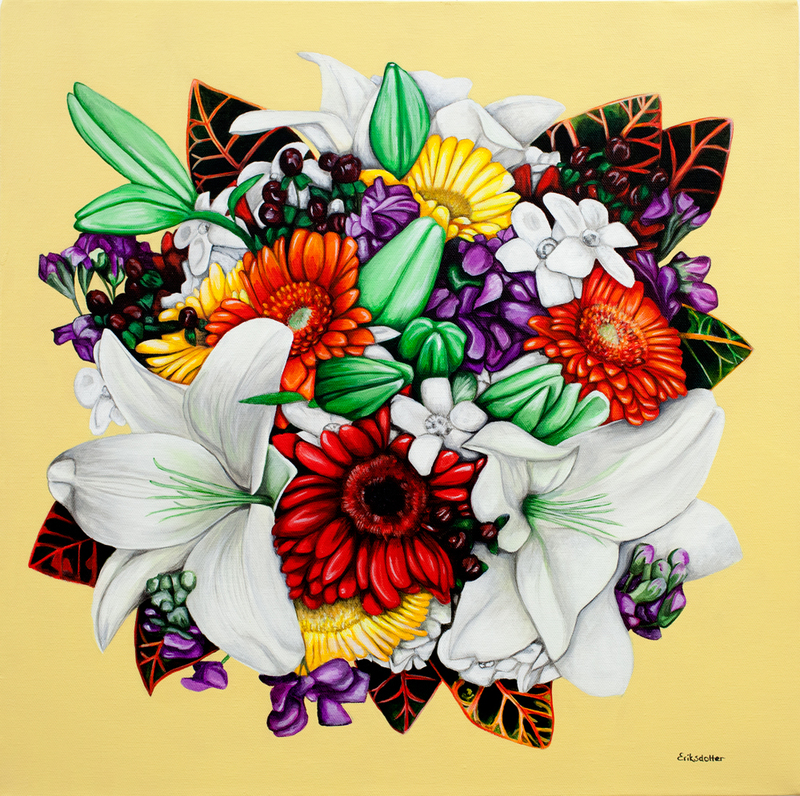 “Linn’s Bridal Bouquet” was a really special painting for me to do because it was ordered by my best friend’s husband as a 5-year anniversary present for his wife. For a year, we both kept it a secret until it finally arrived in Sweden on their doorstep. The painting is absolutely stunning! We both had tears in our eyes when I opened it. I’ve always wanted a piece by you but never would have dreamed that he would ever commission one for me. What a huge surprise! It is amazingly beautiful and the background color is just perfect. A huge thank you. Read more about this painting, see photos from behind the scenes from when I painted it, or view more photos in the bridal gallery. Let’s see what adorable pets I got to paint in 2013, and Luke gets to lead the way. 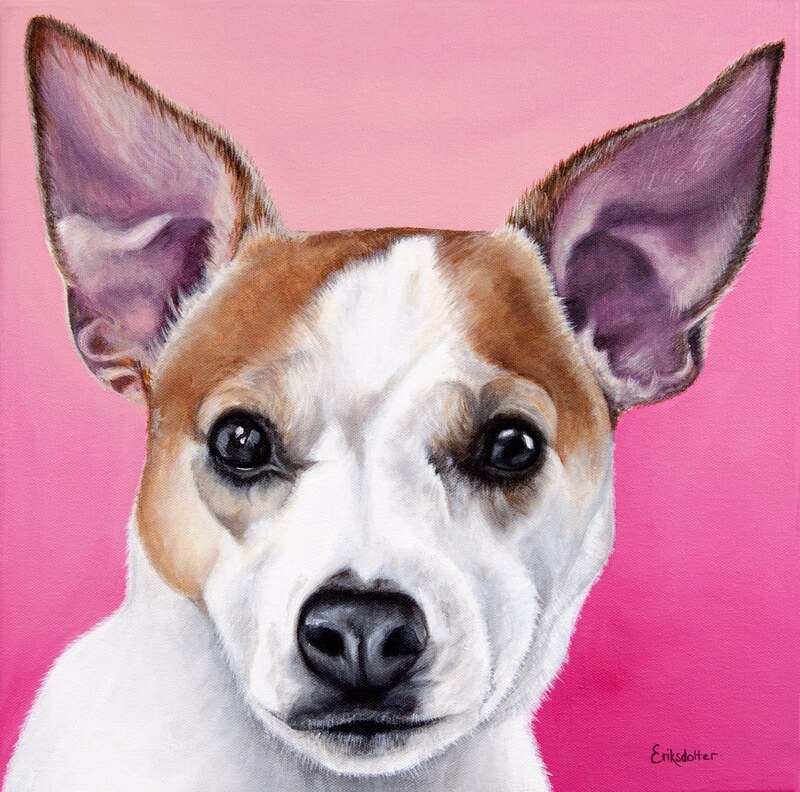 “Luke’s Portrait” was commissioned by a client who already have several paintings of mine. This was her third pet portrait and I’m soon starting her fourth! 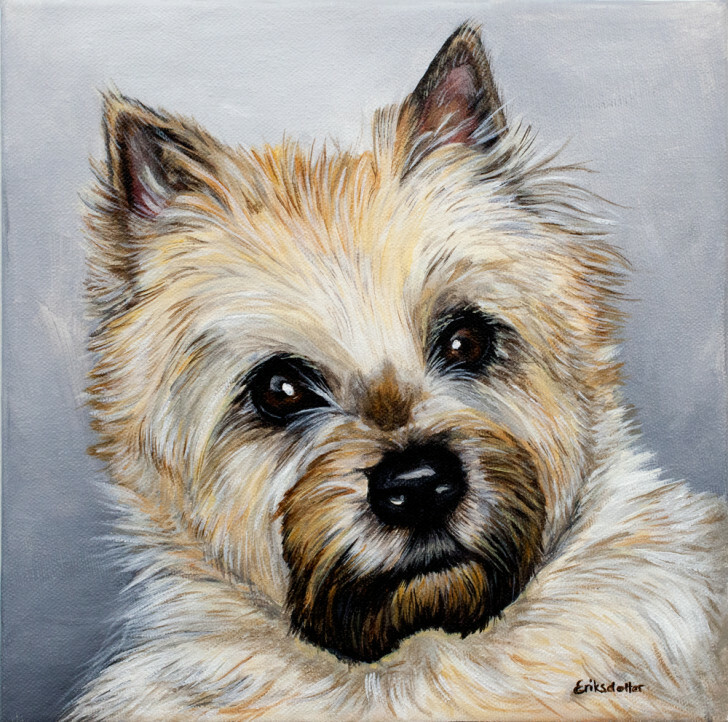 Luke was her darling rescue of nearly 16 years and my client wanted a portrait of him as a tribute to his beautiful life. She has a very special connection to her animals. Sadly, Luke past away a few months later but he got to see his portrait on the wall, like the king he was. 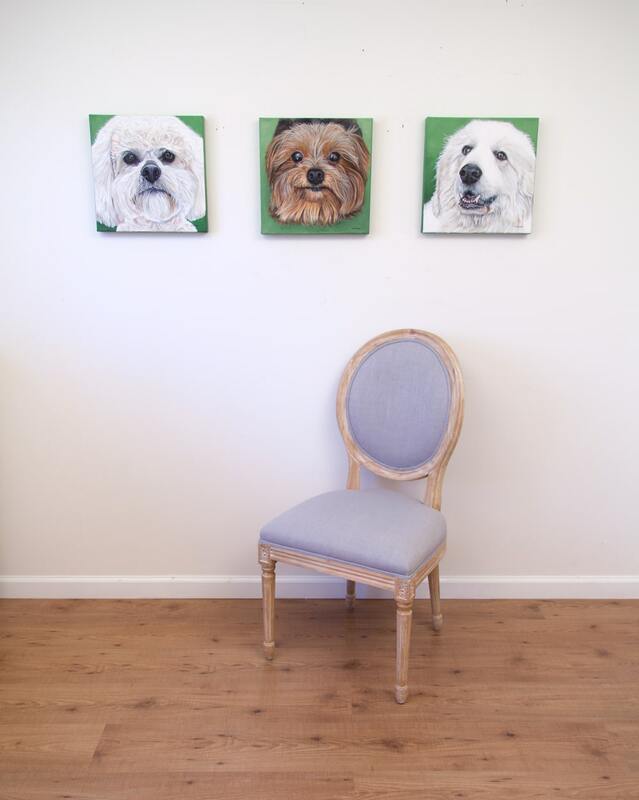 The pet portraits you did for me are just beyond all expectations. Your work is just inspiring, truly. 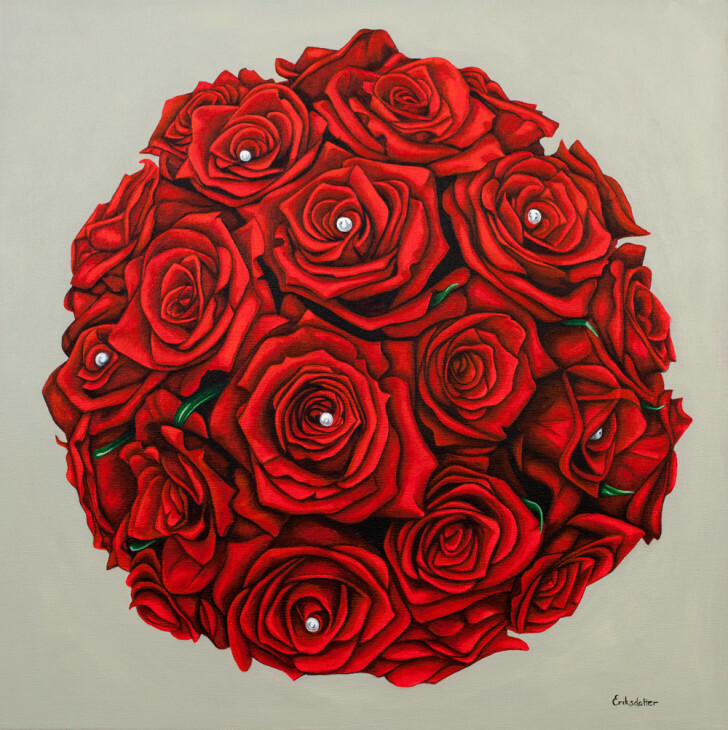 All of your paintings literally appear alive and breathing on the canvas… You capture the image and create an intimacy and warmth that results in a simply breathtaking final piece. You are able to convey the “soul” of the animal. Amazing. Simply amazing. You have a gift. – P.B. of Indiana. Read more about this painting, see photos from behind the scenes from when I painted it, or view more photos in the pets gallery. Sam’s Portrait was a Valentine’s Day gift from a wife to her husband. Isn’t that so sweet? I think husbands deserve a little gift on V-Day as well. Now this piece hangs in their living room and you can see the grown-up Sam showing it off in this photo. Oh my goodness! You have completely captured his happy-go-lucky personality! I’m blown away. It’s funny when you see other’s beautiful paintings of their pets — but when it’s your’s it’s just remarkable how you capture the personality on canvas!” – L.F. of Virginia. Read more about this painting or view more photos in the pets gallery. Austin’s Portrait was commissioned by a couple in Pennsylvania who has followed my art for some time now and own several of my fine art prints. 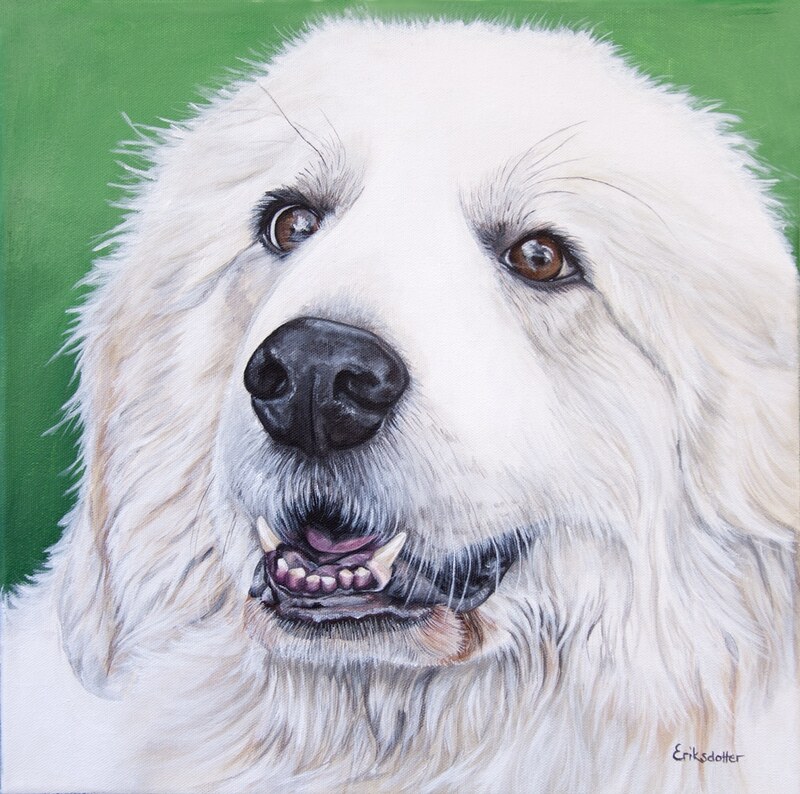 Their lovely family dog was growing older and they wanted a portrait to enjoy while he was still with them and a keepsake when he no longer was. Sadly, Austin passed away a couple of months after the portrait was finished. 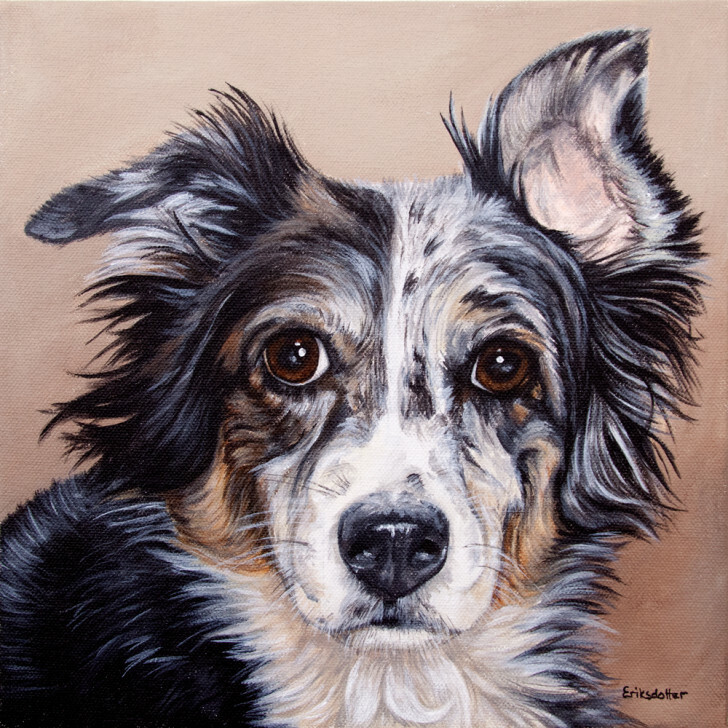 Elsa’s Portrait was commissioned by a client in Sweden. She wanted to surprise her husband with something meaningful and thought of my pet portraits. She owns a couple of original pieces of mine and I was honored when she requested a portrait of their darling dog. I chose a light gray background which fits in with the Scandinavian interior design my client has, which still highlighted Elsa’s fur really well. 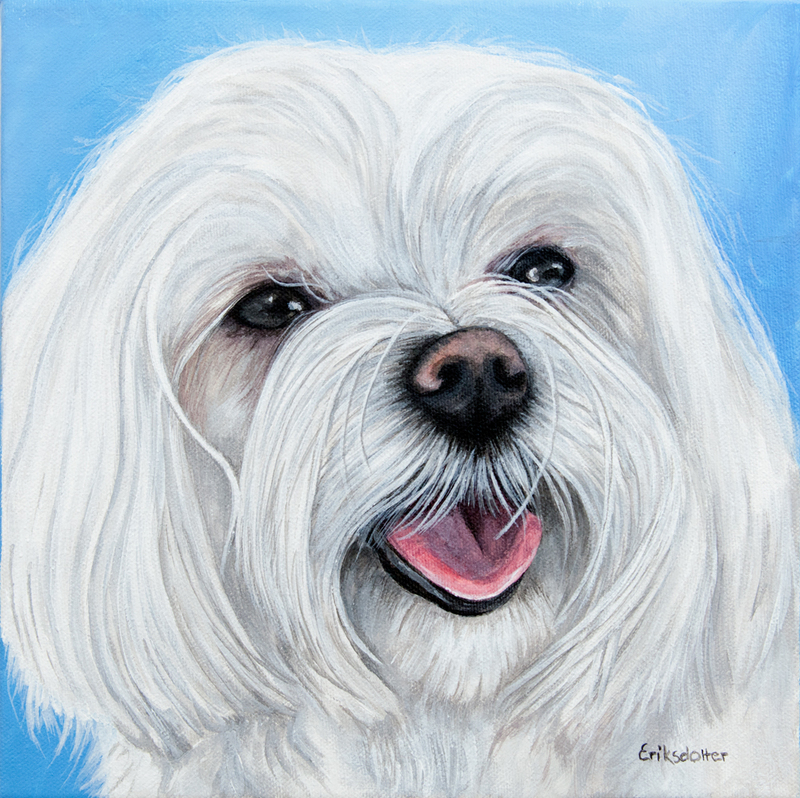 Lucy, the Maltese was commissioned by a client in Virginia. He had seen my portraits online and wanted a portrait of their beautiful Lucy. His wife suggested a blue background and I tried to make it a lighter blue to compliment her feminine nature and her very white fur. 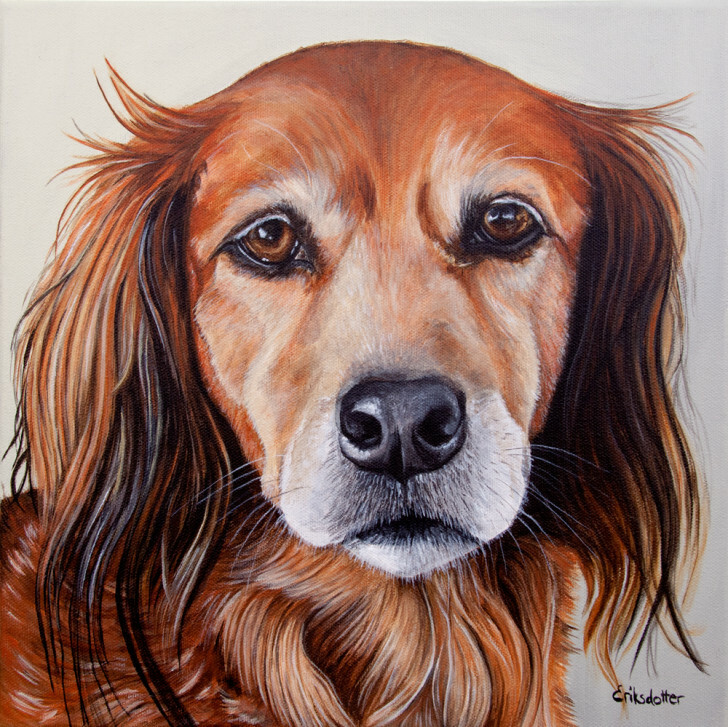 Sasha’s Portrait is an original painting commissioned by a woman in Virginia who wanted to surprised her husband with something special for his birthday. This lovely dog had been his for many years, and unfortunately it had passed away a few years ago. 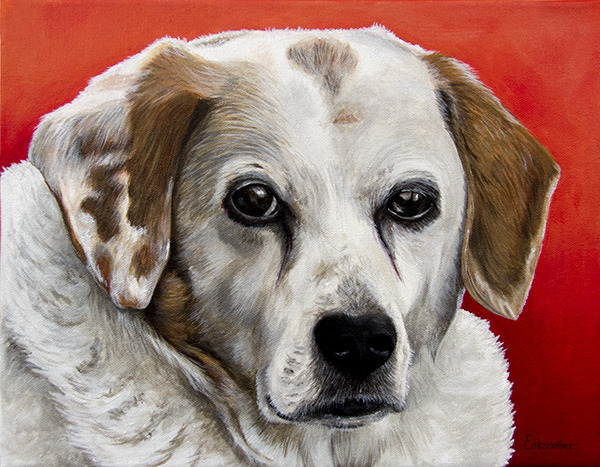 When she saw one of my pet portraits during a studio visit, she knew this is what she wanted to give. 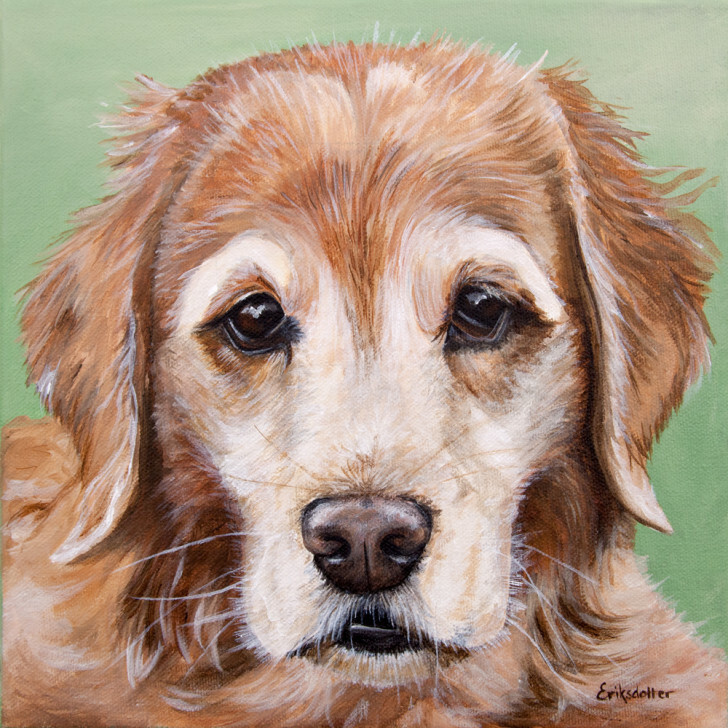 Maggie’s Portrait is an original painting commissioned by a man in Texas whose golden retriever is 11 years old. While she shows her age in some ways, she is very much a young dog at heart. She loves taking her toy out in the backyard and roll back and forth. She throws it up in the air and catches it. 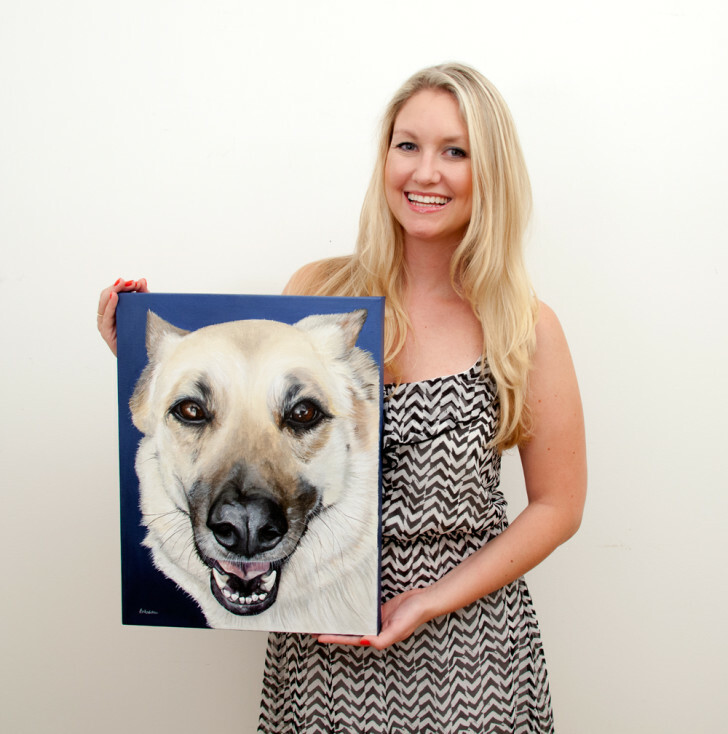 Jax’s Portrait was commissioned by a client from Virginia who wanted to capture her daughter’s dog on canvas. 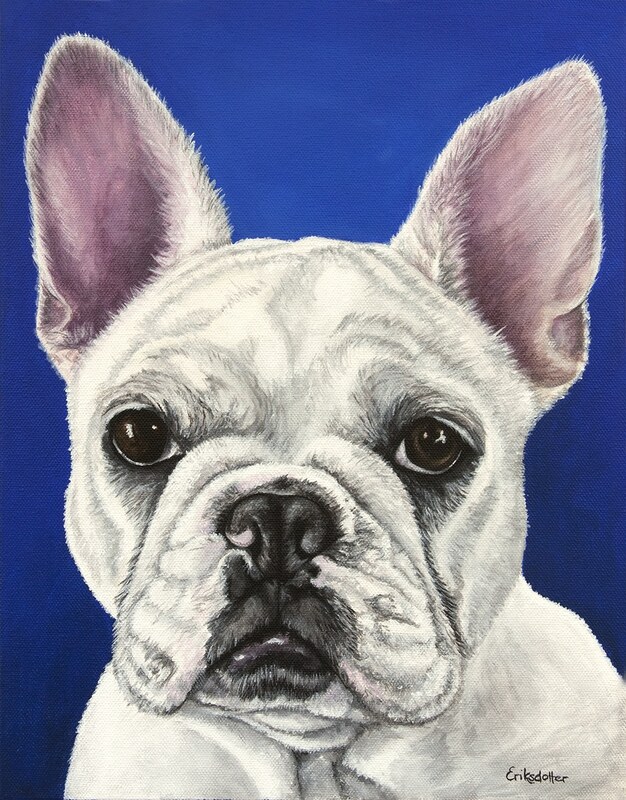 This was the client’s second custom order as I had the honor of painting Mosby the previous year, also her daughter’s dog, which received rave reviews from the family. It is a wonderful compliment when clients return for more. Canela’s Portrait was commissioned by a client from Maryland whose darling companion recently passed away. He had rescued her from the streets of Mexico and wanted to remember her in this wonderful way after many lovely years together. 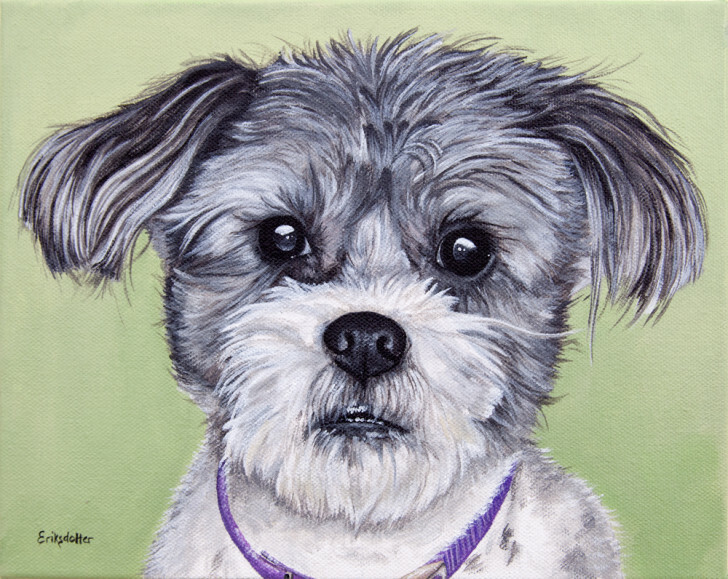 Gadget’s Portrait is an original painting commissioned by a man in Virginia who wanted to surprised his wife with a portrait of their dog, Gadget, a Shih Tzu and Jack Russel mix, for Christmas. A very special gift indeed. 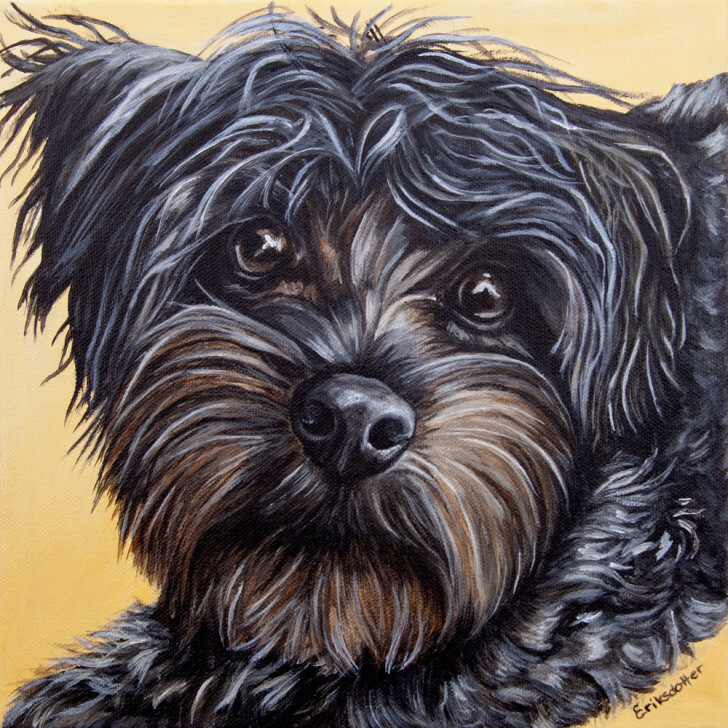 Dos’ Portrait is an original painting commissioned by a client in Virginia to her parents for Christmas. Her parents took care of this dog for several years while their son, the owner, re-located thanks to a great job opportunity. Adorable Dos is now reunited with their son. Since they miss him, their daughter thought it would be a lovely gift to give them a portrait of him to keep in their home. 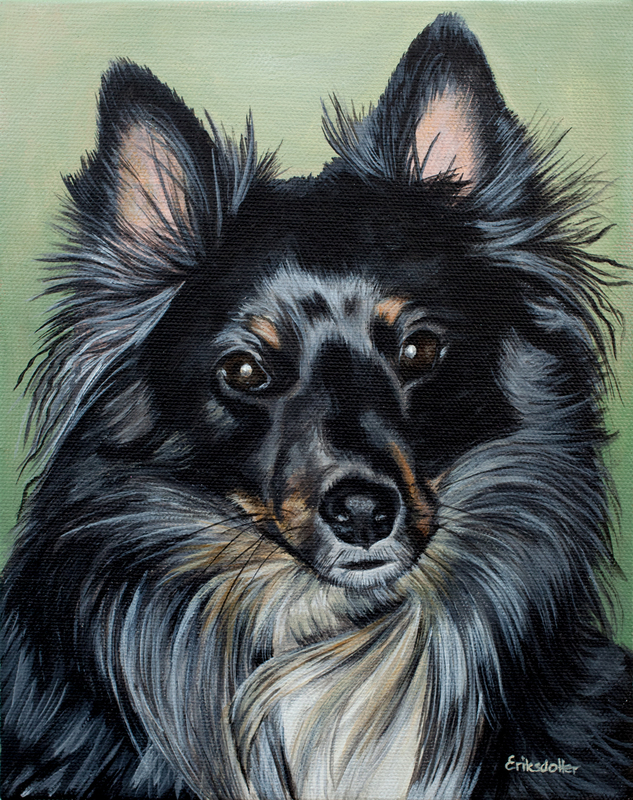 Berkley’s Portrait is an original painting commissioned by a client in Virginia who owns several of my original paintings already. She wanted give her husband a special gift for Christmas. She shared with me that when they had moved in together, they had to give away his two dogs because she was severely allergic to them. 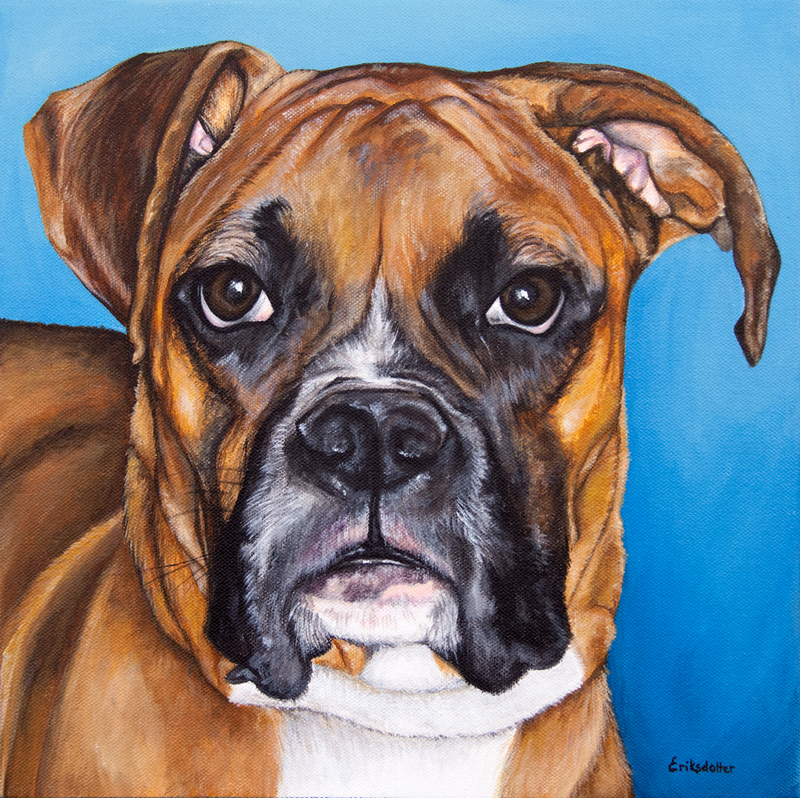 Since then, Berkley, a beautiful and very loving boxer, has passed away and she wanted to memorialize him in this special way. 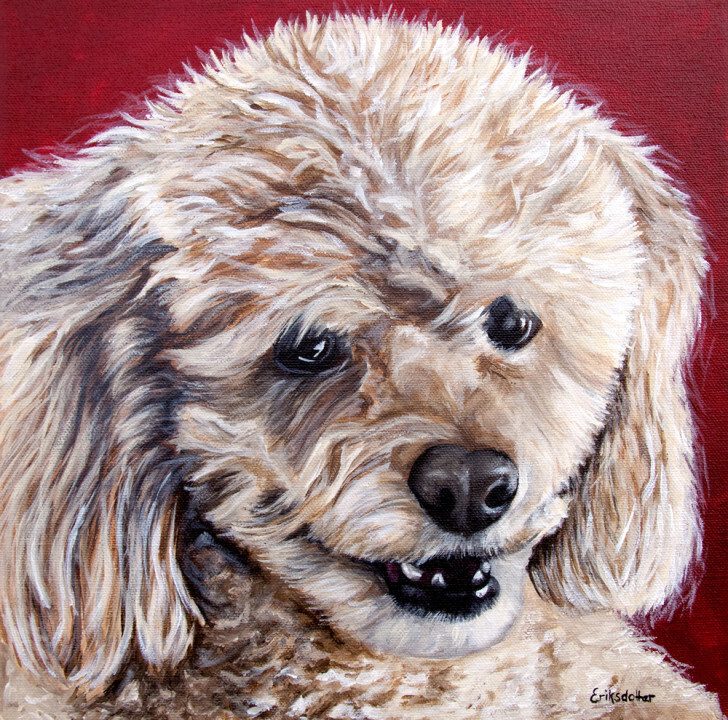 Cocoa’s Portrait is an original painting commissioned by a client in North Carolina who wanted to surprised her Mother with this very special keepsake of their family cockerpoo who had recently passed away. 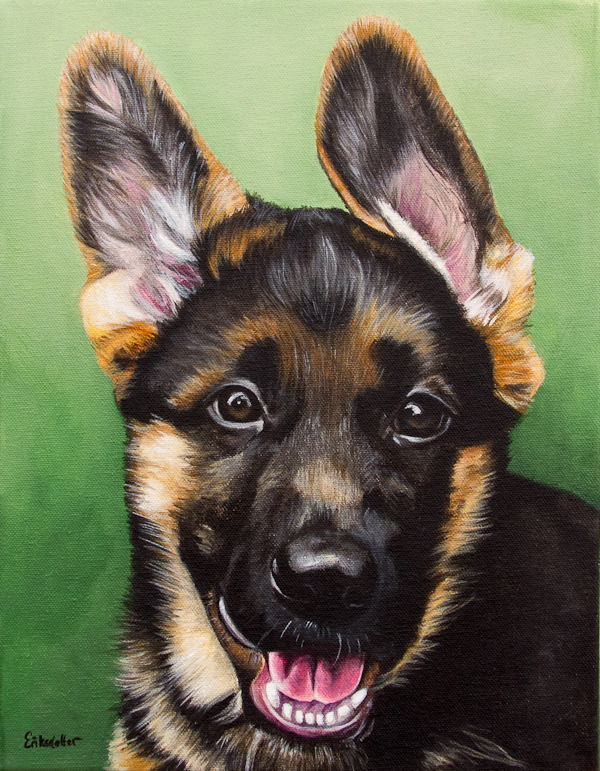 And that wraps up the pet portraits of 2013 and all the custom ordered pieces. Let’s take a look at the paintings included in the “Spring Art Auction 2013.” These are fun “field sketches” (I don’t spend more than 4 hours on them) that people can bid on via eBay. 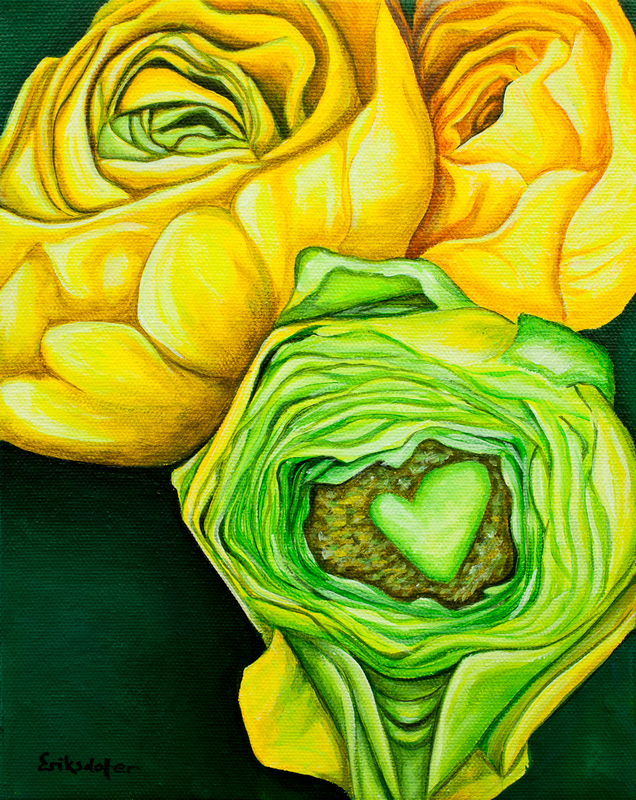 Yellow Ranunculus is of three flowers from a bouquet I just had to have after seeing the heart. The background is a dark green and gray color, which spreads onto all sides. Read more about this painting, see photos from behind the scenes from when I painted it, or view more photos in the pets gallery. A fine art print of this piece is available in the shop. An Unfolding Tulip in all its magenta glory. It’s not often you see a tulip completely open, but it’s gorgeous when it happens. The background takes on a gradient of a mutant blend of dark green, black and a mix of light green and beige. The lighter color spreads towards the top, and the blend spreads onto all sides of the piece. Read more about this painting, see photos from behind the scenes from when I painted it, or view more photos in the gallery. A fine art print of this piece is available in the shop. A lovely Scottish Songbird is singing a song to the sky! 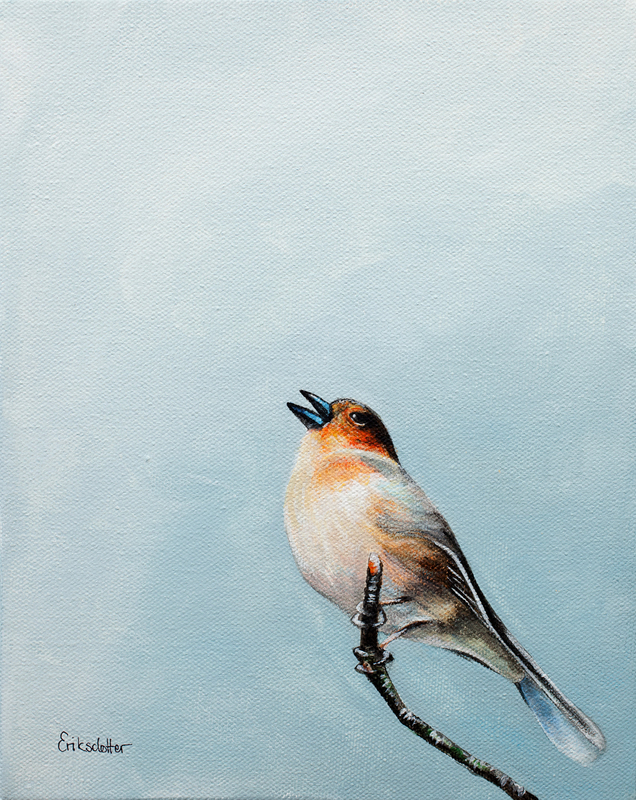 This painting depicts a bird sitting on a branch against a blissful sky in Gairloch, Scotland. The background spreads onto all sides of the painting. Time for some Afternoon Tea! 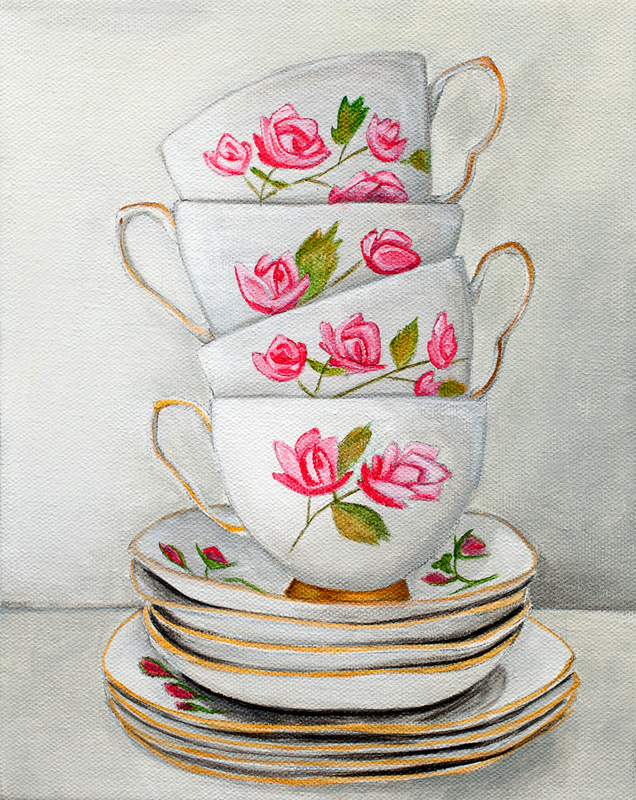 This painting depicts several tea cups and saucers stacked on top of each other, depicted by real china from Peony and Thistle from Scotland. 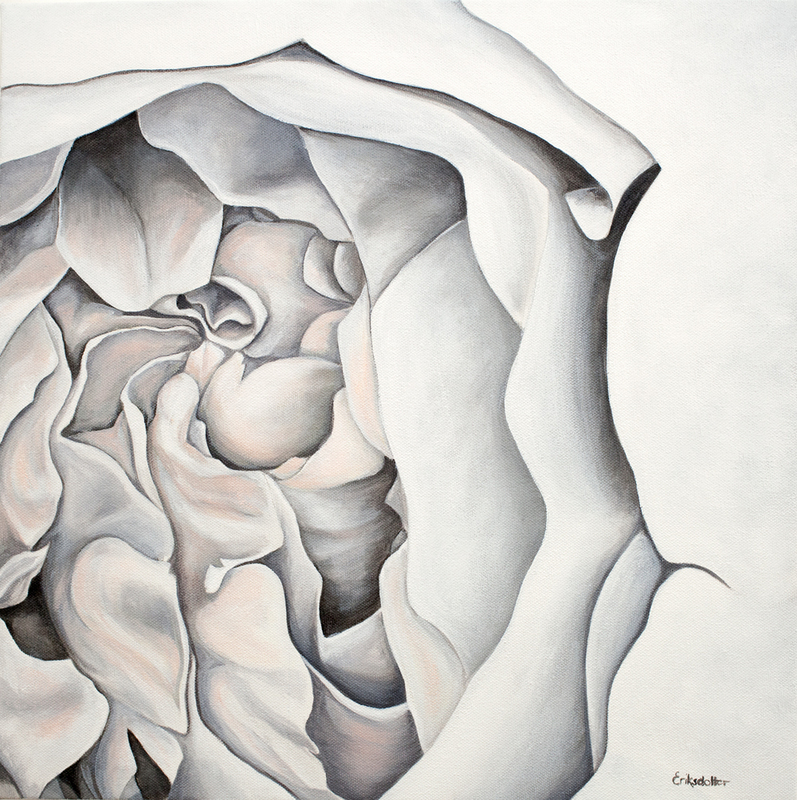 The background is a very light gray with darker gray serving as the shading. There’s a hint that they are standing on a white table against a white wall. 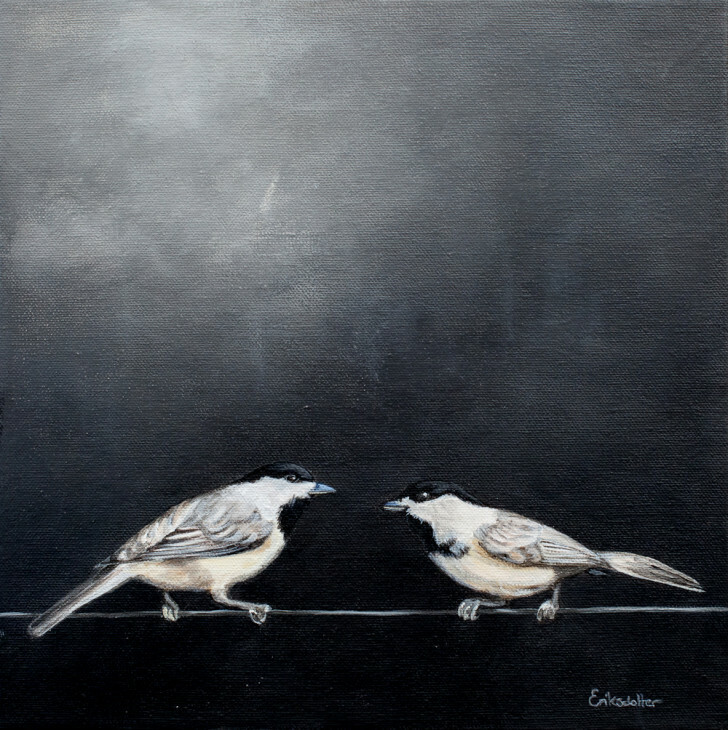 Two Birds on a Wire, sweet darling chickadees. The intense background of this painting provides a stark contrast to the birds, yet still manages to bring a calm feel to it. A pretty Field of Purple Tulips! 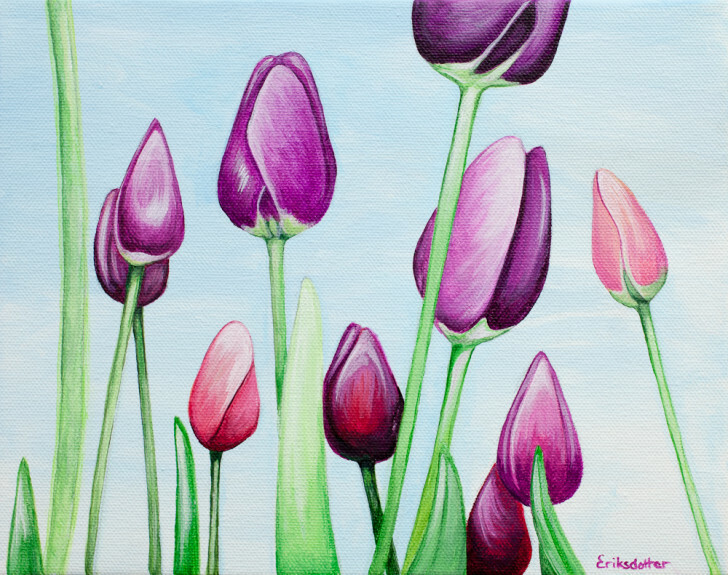 This original painting is of a field of purple and pink tulips viewed from the ground up. The background is a light blue sky and it spreads onto all sides. Periwink-wink – the sign of Spring and new beginnings. 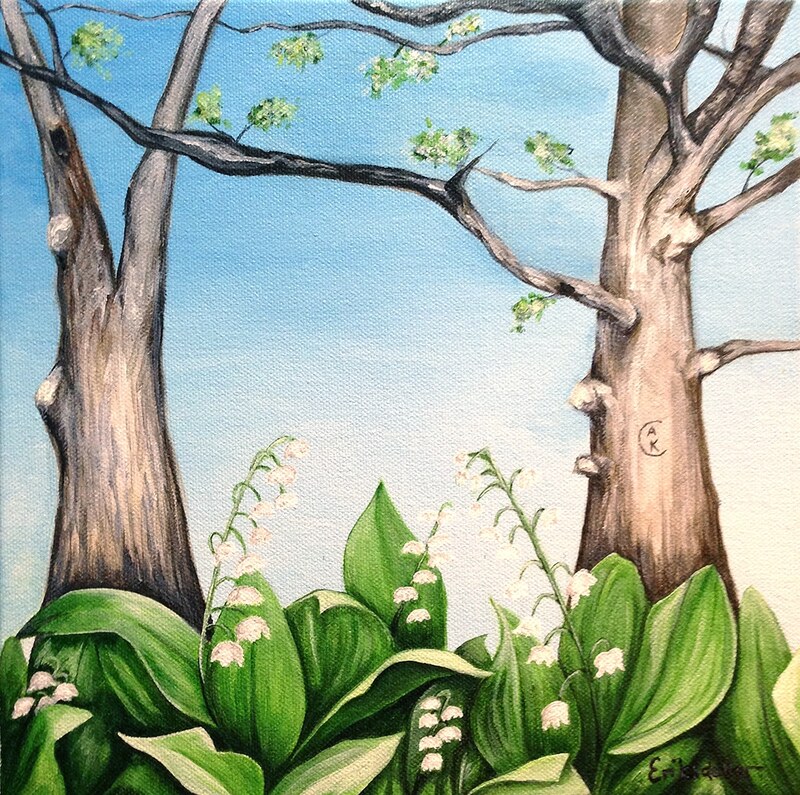 This original painting was included in the Spring Art Auction 2013. It’s a flower that grows low to the ground and is so tiny it’s hard to spot. 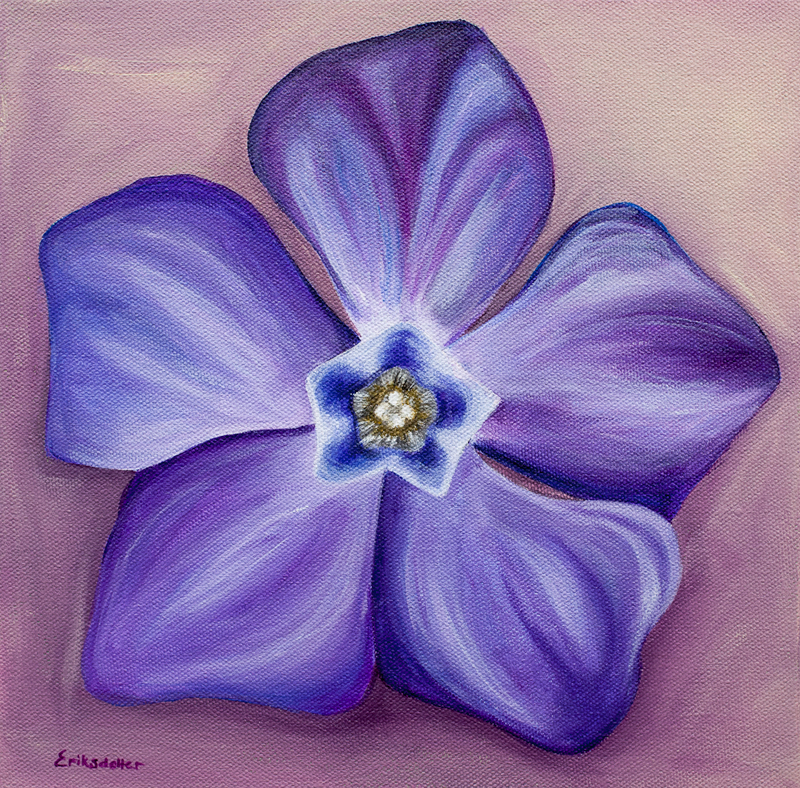 I saw it when my cat, Rasmus, had snuck into my neighbor’s yard and as I picked him up caught this little beautiful and perfect purple flower in the corner of my eye. The background is a reddish purple with beige/white tones. Read more about this painting, or view more photos in the gallery. A fine art print of this piece is available in the shop. Woman and the veil – an intriguing portrait. This is a portrait of H.R.H. 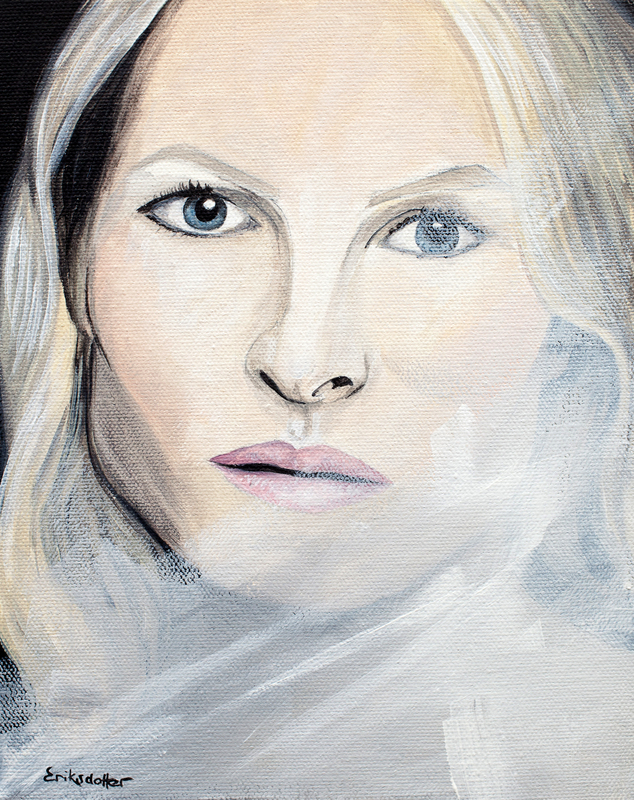 Crown Princess of Norway, based on a photo by Steve Benisty, but it could be any woman partly visable behind a veil. And there we have them – all 33 pieces of 2013. Hope you enjoyed this little summary.